I am just trialling Google Inbox instead of Outlook. I have used Outlook for the last 20 years, so change is not coming easily, but I am finding Inbox better. I like the fact that the interface on my phone is so good. I like that there is a web version so I can have it on my desktop and on my phone. I had considered using gmail, but I find the web platform ugly and overly complicated. 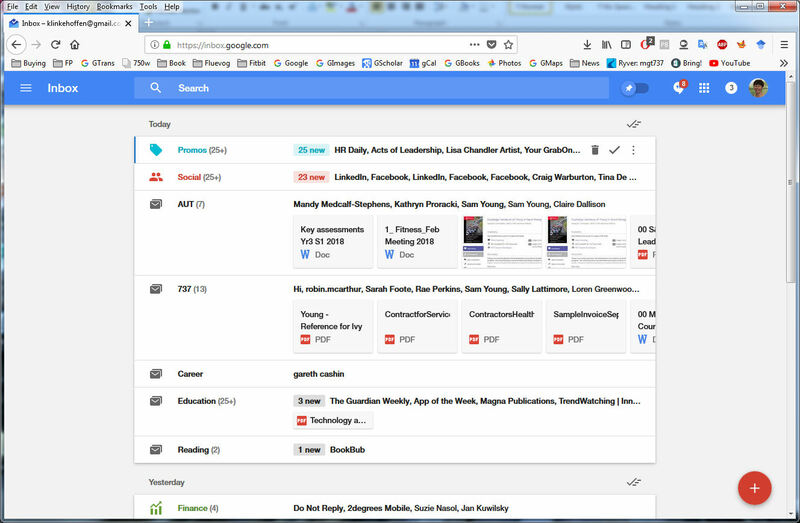 Inbox is a much better looking and more streamlined product than gmail. Having a simple swipe to dismiss - but save - an email in Inbox is so much easier than the act of deleting in Outlook. Google's rules for clustering emails and routing the promos and web updates off to other places is much more intuitive than Outlook. Google's background rules for adding items to finance, for setting up appointments and for determining what is related to something else is wonderful. The spam filter is Google Inbox is MUCH better than Outlook. So much better! There is still email triage to be done, but it is much easier than in the past, and it seems to be getting easier and easier each day, due to adding folders, assigning things to Spam and adding items to social media or promos. I also like that I have ALL my email accounts coming into the one piece of kit, and that each email will reply using its own email address without any tedious setting up. Well done, GOogle! I am aware that I am not yet using Inbox fully, but - like all software - as I get my head around it, I will learn more features. At present I am running both systems side by side. However, I think I might do a trial of not starting Outlook at all shortly, and see how that goes. It will be a good test. 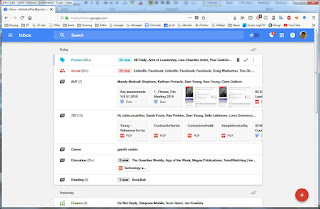 The reason I was brave enough to do this is that a couple of years ago I made my Google calendar my primary calendar, so many of my tasks are now on that platform (read more here). I did that because I have three devices which do not connect: my NMIT PC (Outlook server version), my consultancy PC (Outlook standalone version), and my phone (Google Calendar). This left me with appointments in one place when I was in another - and this led to embarrassment at times. So now I invite my NMIT, and my consultancy personas to any events or tasks as invitees from my Google Calendar. I still have more migrating to do, but my rift with Outlook calendar is growing wider by the day. So while Inbox is in its early days for me, the more I explore it, the less attached to Outlook I feel... it is not yet time to say goodbye, but I can see it coming!